1. If can not swim, can do canyoning? Let everyone safe in deepwater floating familiar with the water, so you will not feel so afraid of the next pit in, you can enjoy the play in the water. 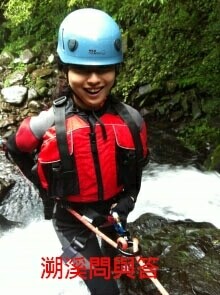 2. canyoning will not be very dangerous? Cable to ensure the full protection of the safety of the players. Trust our guide, to comply with our rules, then you can say that it is absolutely safe canyoning activities. 3. We are all workers rarely appropriate to participate in sports activities upstream? Currently we have arranged upstream activities are day trips experience activities for parents and children to participate in the general public and, of course, for workers to participate. Another will be for the players to participate in physical condition, the activities at any time to adjust. 4. Can children attend canyoning? There is no age limit? Based on our experience led, in general the fourth grade (about 10 years old to 65 years old) can participate in canyoning experience. 6. canyoning need to wear jackets for diving it? canyoning in the so-called abduction row is about traveling the way across the boulder up or down, the body will be sweating fever state, but even if the stream is still very hot summer ice and water conduction of body heat faster than in the air 25 times in Therefore, more should be noted that in order to avoid loss of temperature and jackets to avoid cuts, sunburn, cold cold. 7. If the girls met up to menstruation Can canyoning? 8. canyoning, carry objects of the band coming in? Personal belongings, such as mobile phones, wallets, documents, and three C electronic equipment, please do not bring the water, because the water and not fully waterproof backpack. 9. myopia glasses or wear contact lenses, they should do better? Wearing glasses with a rubber band or fine wire for possible two ears stand in place, to prevent the loss, wear contact lenses can be worn goggles (goggles) to use. 10. In the valley of the size of the number of how to solve? First inform the leader or guide, off-line at least 50 meters of water area convenient place, remember to enter the grass first to arouse his suspicions. 11. canyoning wear shoes, the inner layer need to wear socks it? Generally is not required, but if it is more tender skin who can wear a pair of female short stockings (because relatively affixed to the foot, and because cheaper) to prevent friction blisters after prolonged flood damage. 12. Will the introduction of foreign goods stores upstream shoes, why would not apply to Taiwan Valley? That how to choose a good pair of shoes canyoning? General market and foreign sports brand, the title of upstream shoes, can not be used in a professional and long canyoning; scouring pads to the soles similar material, it really applies to Taiwan, Su Valley line. canyoning shoes to protect the ankle is better barrel.